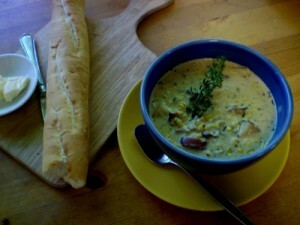 This is a thick and very rich chowder that has a little kick of heat from the roasted peppers. The roasting does temper the heat so if you want more kick add a sprinkle of dried chilies. You can also leave out the bacon but I would call you crazy. 5 slices thick cut bacon cooked until slightly crispy and then diced. Cut the potatoes into quarters and boil for 7 minutes or until just slightly under cooked. Roast the corn and the jalapenos on a hot grill until well charred. Cut corn from cobs and puree 1/2 of it until smooth adding a little of the milk if liquid is needed and dice the jalapenos. In a large skillet on medium heat melt the butter and saute onions for 5 minutes. Add all other ingredients, mix well and turn heat to low. Simmer for 20-30 minutes.